David Waciuma a BIOGRAPHY – he was born in 1945 in Naaro Village, Kandara Muranga County. He went to Naaro / Kirunguru Primary Schools where he did his KAPE. He then proceeds to the Duke of Clocester High School (Nairobi High School) After Independence he was the first lot to be taken to Denmark to be trained as Air force cadet. Around 1964 he came back and said the place was too cold for him. And then in 1965 he was taken again to Egypt Cairo for the same cause. After one year he came back again because of fighting in the collage not completing his scholarship … yet again! His good mother (Wangui Waciama) again talked to Dr. Kiano and he was taken to Canada for full Scholarship to do same cause for 3 years, and then later he joined his brother in America. This is where he started and polished his music career and formed a band. Now in 1971 he came back and told his parents he wanted to become a musician then his older brother whom he was with in USA (Dr Wanjohi Waciama) bought him musical instruments. In 1972 he formed his first band The Monks Experience as a lead guitarist he made an impact to the young and old in the boogy euphoria. He was mostly performing in a club on top of a tall building in the Nairobi KICC, but then he moved to Florida Club along Koinage Street – Nairobi. In 1976 he met the love of his life Anne Kamwende, a student teacher in Kilimambogo Teachers Collage. They tied the knot in PCEA Ting”ang”a Church on the 11th Dec 1976. Then after that he changed from secular music to Gospel music in 1977 and formed RAPTURE VOICES further on he started attending evangelical meetings and getting more socialised in that comunity, eventually he became less active in playing music. David and Anne were blessed with two girls and two boys. David Waciuma died in December 2016. 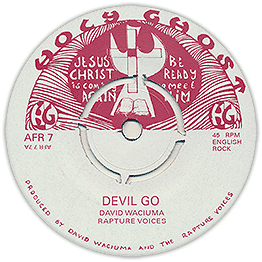 Editors note: The best tracks from David Waciuma and the Rapture Voices are back now as a remastered limited seven inch on Afro7 records. Head over to the shop to secure your copy! 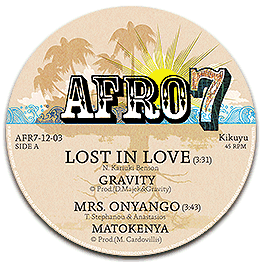 Gravity – Lost in love Towards the end of the 1970s, which had been a decade of abundance in Kenya’s homegrown music industry, CBS (Columbia) set up a well-equipped studio in Nairobi and started releasing records locally. Apart from reissues of European, American and South African hits of the day, they also recorded regional acts. Some of the most interesting output on CBS was produced by Nigerian-born Desmond Majekodunmi, better known as Des Majek, who had moved to Kenya with his wife Sheila who was a gifted singer (together with her husband she would released two singles for CBS Kenya). His early engineering credits in the UK included albums by Fleetwood Mac and Thin Lizzy, and before he started out with CBS in Nairobi he produced a few records for bands in Nigeria. In the early ‘80s Gravity, a group of college students, recorded three singles, two of which for CBS with Des Majek. Group members included Chris Kariuki, better known as Njoroge Benson and Anthony Ndungu, who would later provide lead vocals for the African Heritage Band. While the ballad ‘Goodbye Masai Girl’ catapulted Gravity into the local pop charts, it’s the modern soul / funk on the b-side that makes today’s boogie heads’ hearts skip a beat, and collectors pull out their wallet. Matokenya – Mrs. Onyango Unknown to them, Kenyan disco group Makonde became an unlikely hype on the dance floors of uptown New York, not long after their first international record was released in France in 1977. ‘Manzara’, a raw disco anthem led by a looping clavinet, a distorted bass and the vocals of Greek-Tanzanian band leader Taso Stephanou, was hand-picked by Afrika Bambaataa and Jazzy Jay for its huge percussive breakdown 2/3 into the song, which made it the perfect record for b-boys to perform their moves to. And so a Kenyan song became a part of the early history of hip hop culture, a fact immortalised on a bootlegged cassette recording of Jazzy Jay deejaying in 1978. While Makonde enjoyed some celebrity in Kenya towards the end of the ‘70s, and group member Sammy Kasule kept using the Makonde name when he moved to Sweden, they were soon forgotten by most until the new millennium when diggers rediscovered the Manzara 12 inch (‘Soseme Makonde’) and the group’s second album ‘Matata Riots’ (EMI, 1978). Only recently, their first album reappeared on the radar – the original issue of their ‘Manzara’ hit. ’Dawn in Africa’ was formally a split title, with four Makonde songs on the a-side and the b-side credited to a group named Matokenya. However, at least some of the credits were shared between both groups, including the Demis Roussos-style vocals by Stephanou, and indeed Matokenya’s sound is very much in line with the early Makonde work. ‘Mrs Onyango’ (likely a tribute to Shaban Onyango’s wife), like ‘Manzara’, is a brilliant merger of distorted disco percussion, fuzzy bass, a trumpet that sounds much like the Makonde horns and a guitar riff that appears borrowed from a rumba song. Jabali – Folk Song (Kanyoni) The previous Afro7 12-inch release featured Dai, a song by Francis Njoroge. Nowadays seen around Nairobi with his jazz funk outfit, Francis’ early studio credits include Makonde, Radi and Jabali. 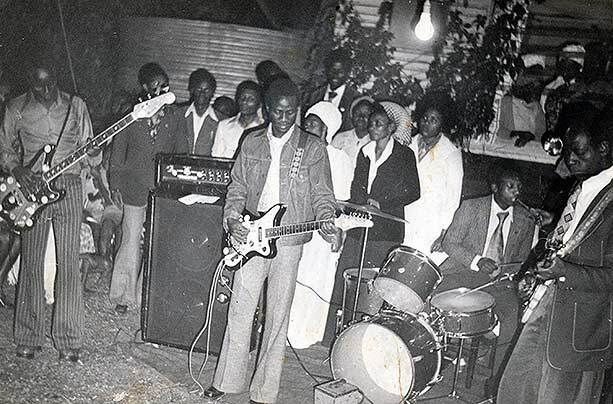 In the latter project he was joined by Joe Kuria, a versatile artist and music manager who in the ‘70s had coordinated Afro-rock band Awengele (featured on the Kenya Special Volume 2 compilation). The Jabali sound was a precursor of what we hear on ‘Dai’, joyful pop with a disco groove and smooth keyboard licks. The vocal melody and the lyrics were inspired by a famous Kikuyu traditional, Kanyoni Ka Nja (‘little bird’) here sung by Chinese kids. 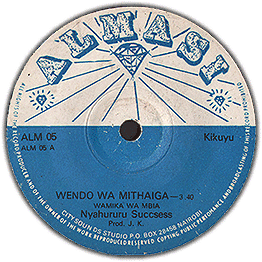 ‘Folk song’ is still remembered by many who grew up listening to Kenyan radio in the ‘80s. Jabali also recorded an LP which remained largely unnoticed and is by now near-impossible to find. 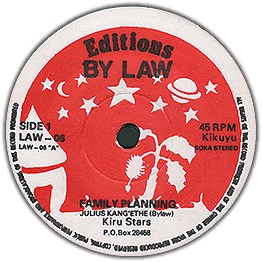 “One of the best Kikuyu disco tracks I’ve ever heard…!” Rickard Masip said having found few copies of ‘Family Planning’ on his last trip to Kenya in 2013. Often the continuing search for something fresh and original can be a striving fare, especially when you have to look through thousand and thousands of dirty old singles. Even though there are many Kikuyu Benga singles, few have the magnitude of By Law’s KIRU1 and KIRU6. Over a hypnotizing groove with a heavy backbeat, Family planning tells us the story of a family dispute between husband and wife, set in a traditional Kikuyu rural setting. The bone of contention in the marriage is that the wife has had enough with giving birth to more kids. They have 8 kids so far but the arrogant and rude husband is still not satisfied and wants more. Though grim it may seem the outfall is the man accept the humble argument of the wife. Notice the slight shift to a more Soukouss driven beat towards the end of the track. The bass heavy ‘Mumbi’ is in more positive fashion a classic love song about the authors passion for a woman he named the song after. He goes on tour to Nyeri where she is from and tells all the other guys to lay off his true love. Massive thanks to Moses Mungai for the translation! Both these tracks are now officially licensed and available as 12-inch through our own in-house label Afro7 records, limited to 350 copies in a heavy custom silk pressed sleeve. Both tracks extended and reworked by Finnish supreme Didier Selin. Buy it now! First feature of 2014 is a doublesided Kikuyu Disco burner. Private production by Jimmy Wa Eunice distributed by Centre Music store Nairobi. Steady beat with little variation, it’s the stone hard groove and the basic but very infectious melody line that sets the mark. Guitarist steps it up a notch and starts his improvisation in the last part. Turn the single around and you have another track that is just as good as the first one. If anyone have any information about the producer or the band, or the record store for that matter please leave a comment. No it’s not the new IPHONE 5 we are presenting here, it’s the B-side of a Kenyan single released on the Kikuyu label late 70’ties. It’s one we’ve come to like during the last few months as it features some cool drumming, a distorted wah-wah guitar and wicked bumpin’ base. In typical Kikuyu style you can’t help but hum along to the refrain. Another love sung we presume as we can clearly hear “I love you” in some of the vocals. Listen to the tempo change at 02:22! We haven’t found any information on the label nor the artist here, looks like a private one off. Great label design, is that a horn upside down? The music speaks for itself here, a religious Kikuyu duet with a great slab of horns and funky guitar drive. 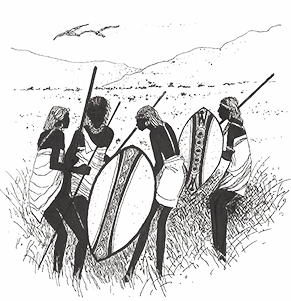 In tradition of similar sounding Kikuyu groups at the time (Lulus band, Rift Valley bros) the sound on the b-side is nearly all instrumental. Note the funky change-up at 1:35 and wait for the bass solo! This smells of dancefloor potential. Probably from around mid seventies 75 or 76. Enjoy! One of many Lulu’s band singles. A prolific Kikuyu group that recorded for several labels, the groups private D.K. Undugu Sounds was run by the groups leader Daniel Kamau. Expect excellent loud pressing and tight production, simple funky aural esthetics’s as tight drumming, catchy vocals and a thousand dollar guitar riff! Perfect for the dancefloors of 2012. A duet for a change, a very sweet growing slow-burn track musically labeled Coast, strangely it has this Ethiopia vibe to it. 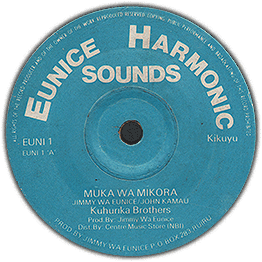 The Famous Nyahururu Boys was a Kikuyu band with frontman James Wahome who is credited for the tune and the label. As it is sung in Kikuyu we can’t find anyone who can translate it, but we’ve got it confirmed from our Swahili source it’s another love song 🙂 Listen in while it build towards the end ..